While Darjeeling Hill town is a small densely populated area, the district of Darjeeling spans across more than 3,000 sq. kms and offers some of the best trekking routes in the world. Where else can you get a sweeping view of four out of the five highest peaks of the world that includes Mt. Everest, Kanchenjunga, Makalu and Lhotse, all in a single stretch? And all that while you trek through the verdant meadows and dense forests that are abundant with flowers like rhododendrons, magnolia, orchids and varieties of wild flowers. You will walk through forests full of trees like oaks, ferns, chestnuts and magnolias. In the Singalila range itself, which is one of the most popular trekking routes in Darjeeling area, there are over 120 species of birds. Overall Darjeeling area has more than 400 species of birds. And add to that the rare animals including the Red Pandas (I've seen one myself at the Singalila ridge and shown its picture as part of the Sandakphu trek route description), barking deer, pangolins, and many other fascinating high altitude small animals. Before I get into all my experience of Darjeeling treks, it is probably apt to mention that proper trekking in India actually originated in Darjeeling about a century back. And it was in 1960s, the Canadian born Father Richard Macdonald institutionalized trekking in Darjeeling and Sikkim area as an organized vacation sport. Father Macdonal came to Darjeeling as a missionary, served in many organizations including at North Point St. Joseph's College where he was a professor in English. He later opened a travel agency in Darjeeling called Summit Tours that offered jobs to the students of the college who could not otherwise find employment. He encouraged them to act as guides for tourists and take them on treks through the fascinating terrain and landscapes. Out of the several trekking routes and itineraries that I have shared below, only a few are heavy treks requiring over a week's time of trekking and meant for regular trekkers. But some of the greatest treks in this region are light treks and can be undertaken by even casual walkers. Here are my favorite treks in Darjeeling area that I have undertaken several times. The luring and serene nature with its breathtaking beauty keeps drawing me back time and again. As you go through all my findings and pictures, I'm sure you will start planning for one as well. Check out the links for complete details of the trek routes and experience. This is one of the most popular trekking routes in Darjeeling area and offers magnificent views of the valleys and mountains on the way. Sandakphu is the summit of Singalila range located at an altitude of 11,929 ft. (3,636 meters). But you don't need to be a regular trekker. If you are physically fit and used to regular walking, you can easily complete this route in about four-five days from Darjeeling. The trek starts from Manebhanjan which is about 80 minutes drive from Darjeeling. The 32km route passes through Singalila National Park and several mountain villages. Your rewards are awesome on this trek. You can experiencing some of the best flora and fauna of the region along the way like colorful rhodendrons, orchids, and if luck, you may even encounter a rare red panda. At Sandakphu you come face to face with the snow peaks of Everest group of peaks, Kanchenjunga, Makalu and many others. You may proceed further to Phalut, or take a return route through rhododendron forests and amazing landscapes. From Manebhanjan Sandakphu trek is usually completed in 5 days. This is a 21kms trek from Sandakphu. So you can either trek up to Sandakphu or reach there by a jeep and then go for this fascinating trek to Phalut. The gradient of this stretch is easy as both Sandakphu and Phalut are at similar altitudes and also the two highest peaks of the Singalila range. You pass through flowering rhododendrons and forests of oaks, chestnuts and magnolia. You get spectacular view of several of the highest peaks of the world including Everest group, Kanchenjunga and others. From Manebhanjan, this trek is usually completed in 6 days. Visit the virgin villages in Kalimpong area, walk through several villages to experience the local Nepali village life, their culture and traditions as you interact with villagers. Stay overnight to get deeper insight into their local customs, music & dance, have traditional Nepali food and enjoy the forest walks & nature with your friendly guide. This route is in Sikkim area with Bhutan and Nepal on two sides, and therefore offers breathtaking views of several mountains that are above 20,000 feet. Such feast of mountains include Pandim, Siniolchu and the third highest peak of the world, the majestic Kanchenjunga. Sikkim offers over 400 varieties of orchids, some 45 different types of attractive rhododendrons and over 4,000 different types of plantations. On this trekking route, you will experience many of such great nature's offerings. While there are shorter versions of this trek, the complete route usually takes 11 days. You can however tailor it to suit your timings. Not all can afford the luxury of trekking over several days. That is either because of want of time or budget. But many would like to get the flavor of trekking the trail of Himalayan mountains which Darjeeling is so famous for. And the good news is, there are day treks possible. You start in the morning and return before its dark. There are two such popular day trek areas. First one is a trek from Tonglu and return to Manebhanjan via Tumling. The other is a trek to Tiger Hill summit. There are several nice trekking trails in Kurseong area that offer light, moderate and extensive trekking experiences. You pass through lush plantations of pine & chestnut trees, medicinal plants and lovely landscapes of tea gardens while exploring the flora & fauna and some quaint villages. There are numerous trek & adventure tour operators that have come up in Darjeeling to cater to the popular treks. 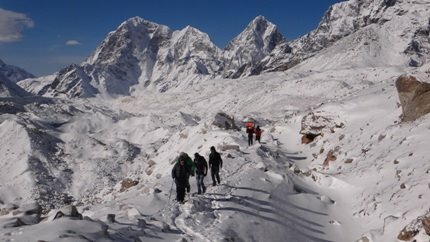 Some provide guides and cater to basic requirements, others manage the entire program end to end starting from booking transports, trekkers huts, porters and all the way to providing food, equipment, guides, and even arranging for permits. The cost varies from one operator to the other and depending on the facilities that you choose. The average cost ranges from Rs. 3,500 to Rs. 4,000 per day per person for Sandakphu/Phalut trek that includes transport, accommodation, food, permit, equipment, guide, porter etc. Average rate for Dzongri/Goechala treks in Sikkim is around Rs. 6,000 per day which includes all cost including transfers, lodging, food, guide, porter, equipment, trek permits etc (Fare Updated: January 2019). There are two great seasons to for trekking in Darjeeling and surrounding areas. The first such season is between April to May, which is the spring and beginning of summer time. The temperature is quite comfortable and varies from a minimum of 6°C to a maximum of 12°C. There may be some chances of rain, but usually short showers. However one great positive side of this season is that you get to see many different types of mountain flowers, especially rhododendrons in full bloom and in different colors. You can also usually trek until first week of June, after which the rain usually comes into play in full swing. 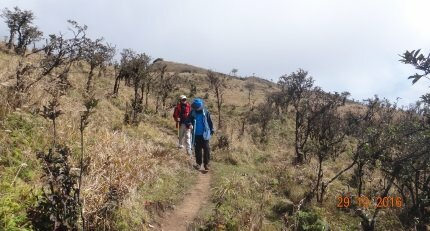 The second season for trekking is from October to November. If the monsoon gets extended, you may experience some showers even in October. But usually both months are dry and visibility is excellent. You will need heavy woolens though during this time as the temperature varies between minimum of 1°C to a maximum of 6°C. There are chances of occasional snowfall as well during this time. You can even continue trekking in Darjeeling area until mid December but the weather becomes really cold around that time. There are trekker huts and private lodges available on the way. Along the Sandakphu (Singalila) trek route there are also GTA (Gorkhaland Territorial Administration, erstwhile DGHC) trekker huts available which can be booked in advance. I have given details about all these facilities as part of the trek route descriptions. In some places, you will also find PWD bungalows. In summary, for the Sandakphu & Singalila trek, there are basic accommodations available in places like Meghma, Tonglu, Tumling, Jaubari, Gairibas, Kalepokhri, Sandakphu, Gorkey, Gurdum, Srikhola, Rimbik etc. You can book rooms/beds in the GTA huts by visiting one of their tourism offices (see Tourism Centers for location & contacts). You will get basic food like rice, dal (pulses), potatoes, eggs etc on the way and in the huts. You can carry some of them if you are not willing to pay a little higher price. Chicken is not always available. I remember having to go all the way to Jaubari (about 6kms) from Tonglu in the afternoon to buy chicken and come back. Luckily we found a jeep on the way. Overall price of the chicken considering the jeep fare turned out to be a super luxury in a basic hut of Tonglu. I would recommend that you carry some biscuits, peanuts, raisins and even tinned food like baked beans, sausages etc. Another important item is glucose (like Glucon-D). It can provide you energy and help in dehydration if required. Salt is a rare item at high altitude, so carry a small packet of salt. While the natural spring water on the way is generally safe, use some water purifying tablets anyway. Also note that there is no water availability for the 21kms stretch between Sandakphu and Phalut. So carry some drinking water with you, at least for this stretch. There are tea stalls available at most of the places I mentioned above and they remain open during the day time. Most of these tea stalls close by afternoon or early evening. The trek routes go from low to high altitudes. During the day time when you trek, although you may feel comfortable with light woolens or just a T-Shirt, during the night time the temperature drops drastically. So carry a warm jacket or a sweater and also a wind-cheater. During the winter time, you must additionally carry woolen cap and hand gloves. I would further recommend full length woolen or thermal underwear for the winter. Do take polarized sunglasses for protection of your eyes. Also carry some essential medicines including ones for high altitude sickness. Keep all your extra clothing, snacks and essentials in a rucksack so that you can easily take them out as you may need on the way. You must wear a comfortable pair of shoes that are hardy and tested. Do not wear a new pair of shoes only to find that you develop blisters that ruin your trek. Keep additional pair of socks. One more essential item, a light raincoat to counter the occasional showers that are so common in this part of the country. If you go through a standard trek operator in Darjeeling, they are likely to provide you with the trekking equipment like rucksack, sleeping bags, tents, foam mattresses etc as may be required. These are otherwise quite expensive items. You can also get such equipment on rent at a reasonable rate from the GTA Adventure Sports Office located near the Darjeeling railway station on Dr. S.K. Paul Road in Lewis Jubilee Complex. Remember that it may not be easy to get huts during the peak trekking seasons unless you have booked them in advance. So it may be wise to carry some equipment like sleeping bags, mattresses etc. You will get porters and even mules from the base (like in Manebhanjan) if you don't want to carry all these by yourself. Hi Raj, you've been a great help to my solo tours in Darjeeling region for the past year. Can't thank you enough for this. You described everything so nicely that I never had to ask you anything. I'll be in darjeeling next week again. I need to buy trekking backpack and snow hiking boots. Are there any shop in darjeeling where I can buy products of brands like north face, forclaz, salomon, merrell, woodland etc.? Hi, you can try the store 'Hiamalaya Gears' in Darjeeling (5 Nehru Road, near Pizza Hut. Mobile: +91 97344 74456; Email: [email protected]). They stock backpacks and other trekking gears. You may not get brands of your choice though. The outfitter 'Offroad Adventures' rents trek gears (HD Lama Road, near Vodafone office. Phone: +91 9832054944; Email: [email protected]). Hi I just came across your blog while searching for Tumling trek so I would be very glad if you could tell me whether it is advisable to trek till Tumling in the last week of June. We are two young ladies looking for some time adventure after our exams so we won't be staying in lodges or hut we will be bringing our camping gear. Although the route through Singalila National Park would be closed in last week of June, you can go up to Tumling. But due to monsoon time, there is likely to be heavy rains and camping is not recommended around that time. However this is not a good time to trek, there will be virtually no trekkers along the route. In several patches, the route can get quite bad with mud slush and heavy rains would require good rain coats all along. Hi, there are several trek operators in Darjeeling and they all offer trek packages with their own guide. They may however arrange porters through Highlanders if required. If you want only a guide and want to arrange everything else on your own, better to go directly through Highlanders at Manebhanjan. Dear Sir, I am a Masters student at IIT KGP, please suggest me two days trek plan in Darjeeling. Where can I halt? Trek from Manebhanjan to Tonglu on day1, then to Tumling and back on day2. You won't need a guide or porter for this trek unless you go beyond Tumling and enter the Singalila National Park. Accommodations: Hotel Pradhan in Manebhanjan (very basic), GTA Lodge at Tonglu. If you do Tumling first, you can stay overnight at Tumling (Shikhar Lodge or Siddharth Hotel), and then get back via Tonglu. Book in advance. Hey, First, thank you very much Raj for the website. I am planing a two trek to Tumling on September first week. Is it required to get any permission since the village is in Nepal? Is it compulsory to have guide for the trek? Thanks and Regards. Up to Tumling, no permit or guide is required. Just returned from a September 2015 trip to Darjeeling. This website was tremendously helpful for our trip. Great information and advice. And well presented. We especially benefited from your recommendation for Ashmita Trek & Tours. We did a day trek with Subash to Tonglu. The hike and experience was fantastic -- varied terrain, great views, unique cultural experience. Subash was a great guide and a friendly host. Thanks again for putting together such a great website. 1) what is the cheapest way to reach Tonglu? 2) do I need a permit till Tonglu? 3) if we need one, how do I get a permit on my own? 4) is it mandatory for me to have a guide? 5) will i get accommodation in tonglu? For the cheapest option, take a shared jeep from NJP up to Mirik, then another one up to Manebhanjan. If you are not trekking, then take one of the occasional shared jeeps that ply from Manebhanjan towards Sandakphu. But they will go to Tumling, and not Tonglu. Tonglu is 2kms trek from Tumling. No permit is required up to Tonglu or Tumling. Accommodation is limited in Tonglu (GTA lodge). You will get private accommodations (lodges/huts) in Tumling. We are a group of ten friends planning for a 3 - 4 day trek to the areas surrounding Darjeeling. We all are working at the same office and have a leave of 7 days at max including weekends and travelling shall take 3 days of that leaving us with 4 days in hand. Our budget for the trip is 4000 at max per person excluding the travel to NJP station. Can you advice if there are any travel operators we can contact with and also please suggest a good route for the job. We are not looking ahead to complete the whole trek. If you think it shall be better please suggest a route that shall not be the complete trek but we are looking ahead for an experience of staying out in Tents. You can contact Subash Tamang of Ashmita Trek & Tours (copied in this email) and work out a customised trek. One option is to trek from Manebhanjan up to Sandakphu (3 days via Tonglu, Tumling, Kalipokhri) and get back by a jeep/Land Rover. Note: you can reduce your cost by using Darjeeling Tourism Card (one card for every two adults). They give 15% discount on the card. Hello, Dhotrey to Palmajua is about 5kms ... suitable for trek or 4 wheel drive vehicle. Dhotrey to Tonglu is about 5kms (3.5 - 4 hrs uphill trek). Tonglu to Tumling is 2kms. From Palmajua there is a motorable route up to Rimbik via Barahatta (18kms ... 3.5 hrs trek). From Rimbik there are routes to Sandakphu/Phalut. Alternatively, come back to Dhotrey and trek via Tonglu.